The coffee was amazing!! The best i have had outside of Australia! Amazing location. 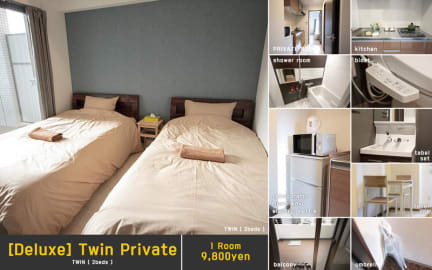 Less than 5 minutes walk to the station (it's really just across the road...), 2 stops away from Universal Studios Japan, and probably about 10 to 15 minutes ride away from Namba area/Dotonbori. There were small eateries around, and a convenience store just opposite the hostel. Facilities were GREAT. The bathroom was clean and warm, with hair-dryer, make-up remover, and hair pins for our use. Service was amazing. Staff were friendly and helpful. NIce facility and friendly staff, will definitely come again! Great place. A little less social than hoped for, but overall very nice. Right next to JR railway line and a quick ride to any major sight in Osaka. Neighborhood is quiet and friendly. Facilities lovely. Comfortable stay here with a very clean environment. Aesthetic cafe below and bathrooms were well maintained with many items provided for free. Easy to find from the train station as well. Checked in really late but staff was still friendly and accommodating! Will definitely return back to Hostel Jin. 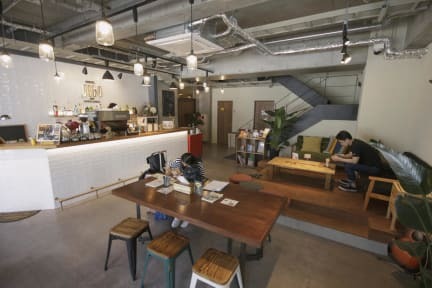 Great hostel with good coffee and a nice relaxing vibe. 2 stops from Osaka central so Inna great location. Kitchen was low on utensils and could do with a little more as we cooked at hostels to save money but when we asked for things they provided what they could. An improved self catering kitchen and I would give it 10/10. Bathroom facilities were amongst the best I've used. The most tidy, quaint hostel. Staff were super helpful and gave us lots of ideas of things to do. The cleanliness of the place was insane!! Rooms were a little small but there were common areas to relax. Not a party hostel- quiet but friendly. Location is close to train station and we found Osaka easy enough to navigate via rail. Would 100% recommend and stay again! The staff was super friendly, the location is great if you are planning on going to Universal Studios. The only downside was the WiFi, I could not connect and when I could it was spotty.